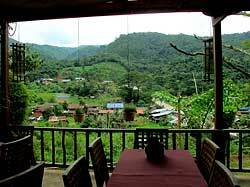 Pongza Restaurant is located at the Boklua View (Resort) (see below) in the foothills of Doi Phu Kha, nearly 700 meters above sea level. 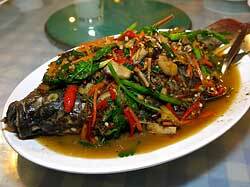 Both restaurant and resort are owned by Toun Upajak, an English speaking Thai who is a trained chef. The restaurant serves a combination of Western and Thai dishes, including local (jungle) specialties. 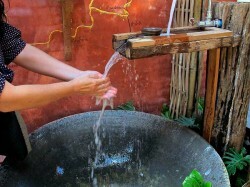 They make their own bread and desserts (western-style) and use produce from their own organic gardens whenever possible. 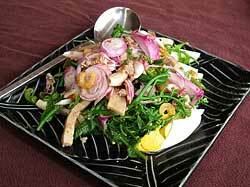 Although the menu is not extensive because of the difficulty in getting ingredients at their remote location, there are still plenty of interesting dishes to choose from. 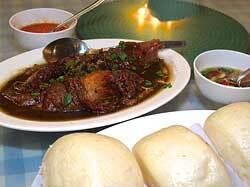 I’ll start with a couple of the dishes for, after all, the main reason to go to any restaurant is the food. 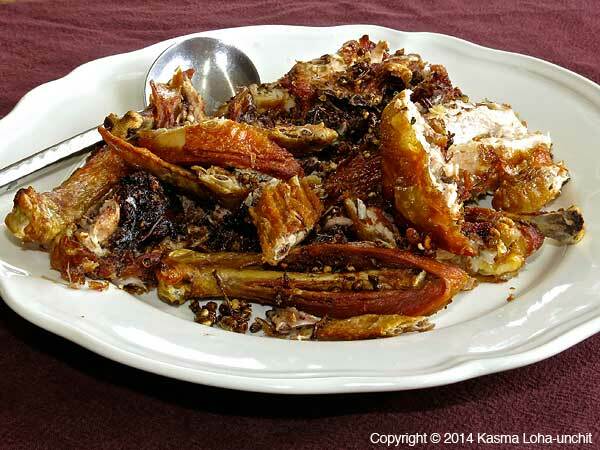 If the restaurant has a “signature dish” it is ไก่ทอดมะแข่วน – Kai Tod Mak Wan – Fried Chicken with Ma-kwaen Herb. มะแข่วน (ma-kwaen or ma kwan) is usually identified as Zanthoxylum Limonella Alston and it is apparently fairly common in Northern Thailand (including Mae Hong Son & Chiang Mai). The genus Zanthoxylum (in English commonly known as prickly ash) includes the more commonly known Sichuan (or Szechuan) pepper. 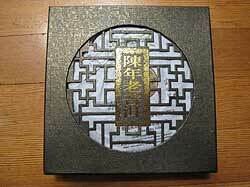 It has an exotic flavor and, like Sichuan peppers, a somewhat numbing effect on the mouth. 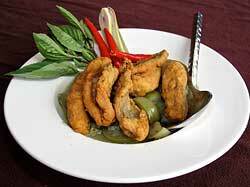 It adds a very interesting, almost floral, taste to the chicken. 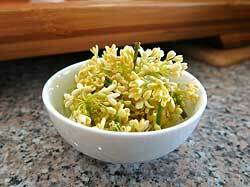 It is used medicinally in Thailand to treat toothache, gum disease, nausea, dizziness and certain menstrual problems. Its oil can also be used as a mosquito repellant and has been investigated with some promising results as a possible bactericide for multi-drug resistent bacteria. 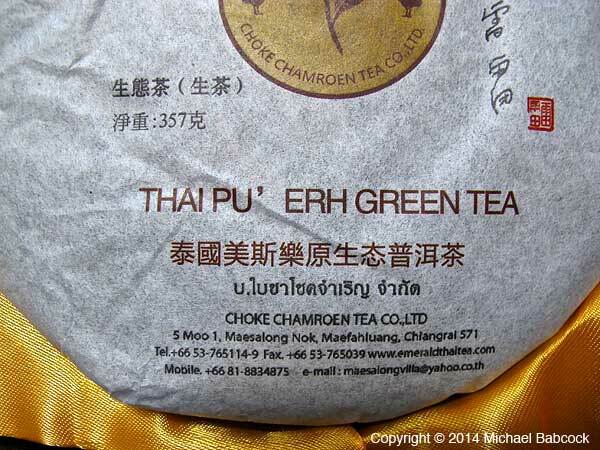 If you want more information about this interesting spice, do an Internet search using the Thai name (copy & paste) – มะแขว่น. Nearly all of the articles will be in Thai so you’ll need to hit the “Translate this page” link. There’s a company in Canada – spicetrekkers.com – that sells it under the name of Mah Kwan Wild Pepper; all-in-all they have over 25 different kinds of pepper. The restaurant has a number of dishes with a type of fern growing in the local jungles, called ผักกูด – pak kood. 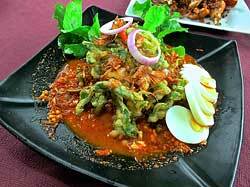 The dish on the left above is Yum Pak Kood Ruam – ยำผักกูดร่วม – a “yum” salad with the fern, ground pork and squid. We had this on our visit this January (2014). Above right is a Fried Fern Salad – Yum Pak Kood Tod – ยำผักกูดทอด – Kasma had this dish on a visit during December 2012. This particular dish wasn’t on the menu when we visited in 2014. On our visit we ordered one other dish, the Green Curry with Crispy Catfish – เขียวหวานปลาดุกกรอบ (Kiow Wan Pla Dook Krob) – shown to the left. It had a lovely presentation, as you can see; however I found the curry itself a bit disappointing. 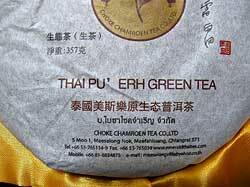 It was ok, just not terrific (which somehow I come to expect in Thailand). 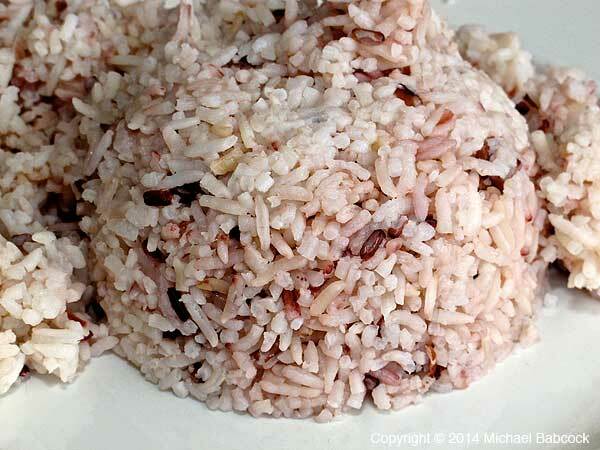 Incidentally, the food here is served with a lovely purple rice (that’s what it’s called, in English, on the menu); it’s a whole grain rice with a couple different varieties cooked together. If you are so inclined, Pongza does have some very tasty desserts. 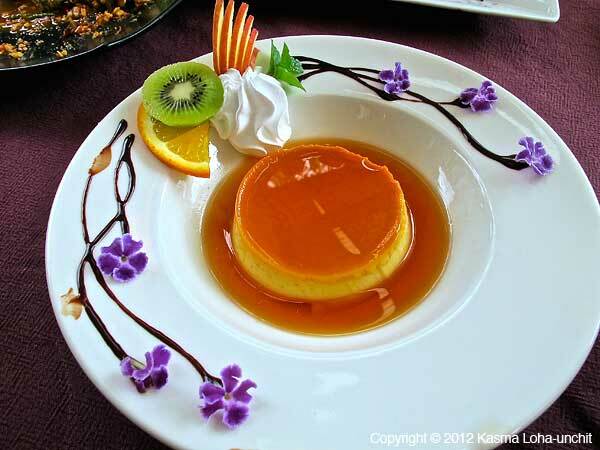 Above left is what the menu calls “Caramel Cream” – it looks very much like a delicious Crème Brûlée. 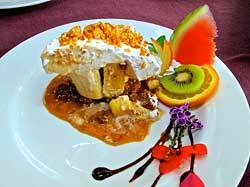 The dessert on the right is called “Banana Banoffee” and looks mildly decadent. 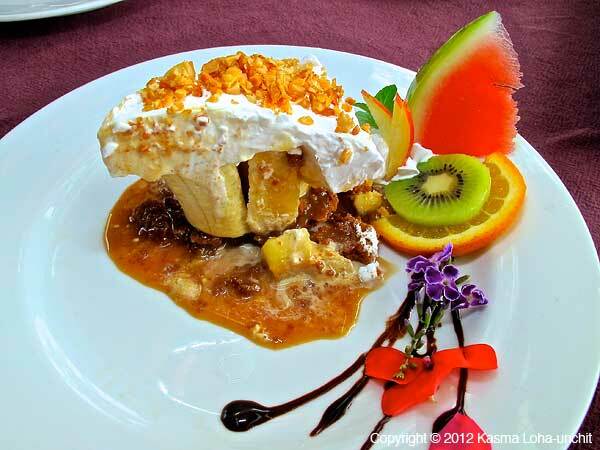 Kasma (who took these pictures on the December 2012 trip) said that they were quite tasty. 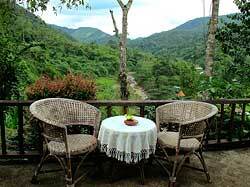 The restaurant is in a lovely physical setting; it is quite pleasant to have a meal next to the mountain views from the dining room. You see a couple of examples above: some of the tables are right at the edge of the deck, giving a memorable dining experience. 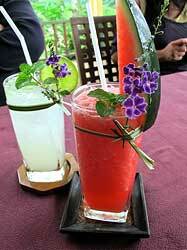 If you’re ever in Bo Klua, I recommend eating at Pongza Restaurant. The food is very good – some dishes excellent, others good – the presentation is lovely and the views are quite nice indeed. Give it a try. I can’t end the blog without at least mentioning the Boklua View (Resort) where Pongza restaurant is located. It’s a wonderful, peaceful place to stay. Many of the rooms overlook beautiful views, such as the one above right. 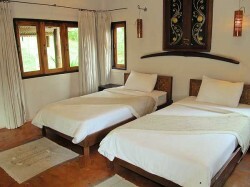 The resort is very nicely appointed, as you can see from this shot of the bedroom above right. There are numerous beautiful and tastefully done details, such as the wash basin above right, and the flowers floating in water (further down the page) It’s a great place to stay while in Bo Klua. Mae Salong – แม่สลอง – (or Doi Mae Salong – ดอยแม่สลอง – doi meaning “mountain”) is an area in northern Thailand in Chiang Rai province where one of the main activities is growing tea, primarily high mountain oolong tea. 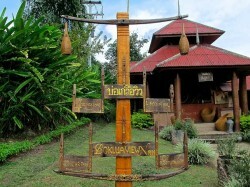 The village there is called Santikhiri – สันติคีรี. Mae Salong reminded me of the village Baan Rak Thai in Mae Hong Son province, mentioned in Thailand Trip – Favorite Moments, Part 2 (scroll down in that blog). 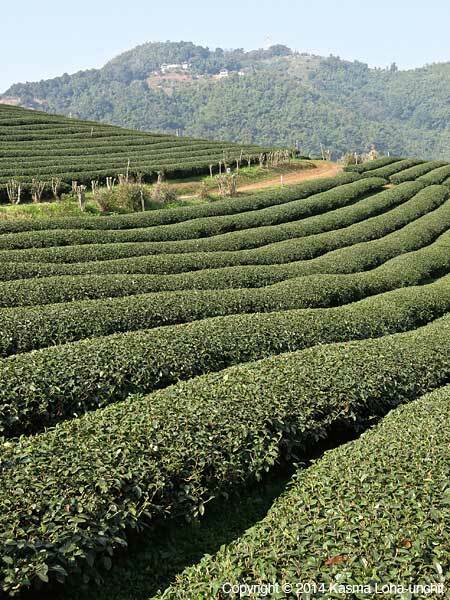 Both places are found up in the hills and are home to ex-Kuomintang soldiers, many from Yunnan province in China, who eventually began cultivating tea. 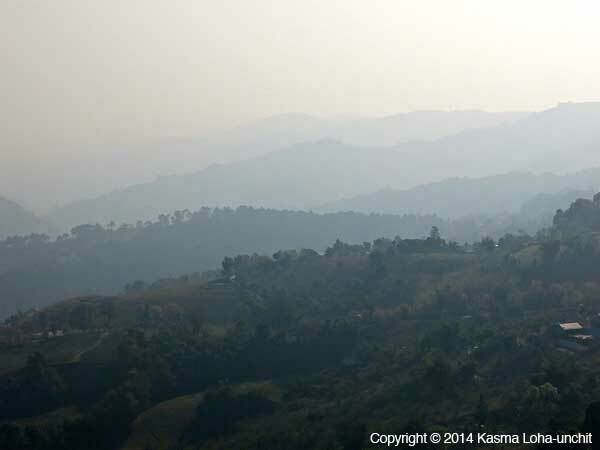 The soldiers in Mae Salong were from the Kuomintang’s 93rd division and they continued fighting the Chinese through the 1950s, growing opium to fund their continuing military operations. 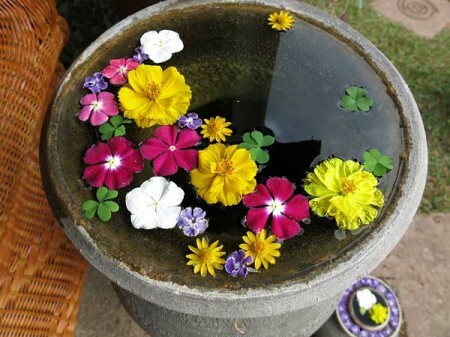 They were granted asylum in Thailand in 1961 and, later, Thailand enlisted them to fight a communist insurgency in Thailand until 1982 when they laid down their arms and were granted Thai citizenship. There’s a fascinating article on China’s Forgotten Army. 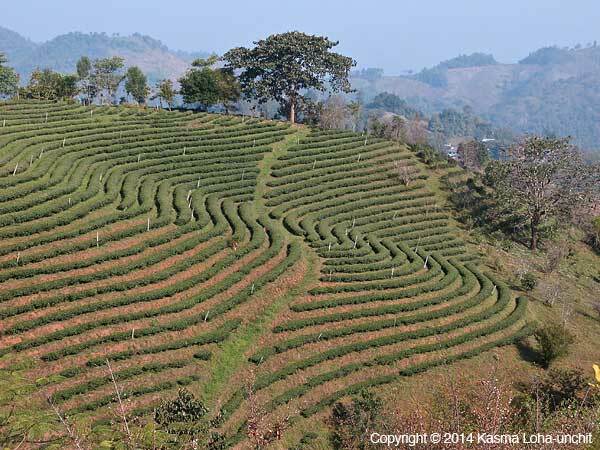 The drive to Mae Salong, found about 80 kilometers from Chiang Rai, wends its way up to Santikhiri, which is at an elevation of around 1,300 meters. 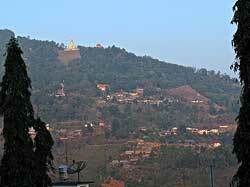 It is quite close to the Burmese border. When we went in January, the climate was decidedly cool. Along the way we stopped several times to admire views, such as this one to the left. 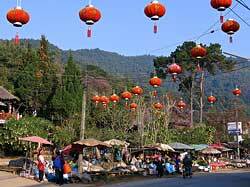 In addition to the ethnic Chinese living there, you also find Akha, Yao, Karen and Hmong hill tribes, many of who originally came from southern China or Myanmar. 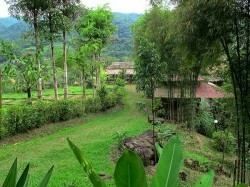 In addition to the tea, Mae Salong is a popular destination for trekkers. 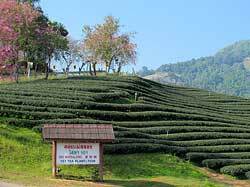 As you approach the town, everywhere you look there are rows and rows of tea plants hugging the contours of the hills. 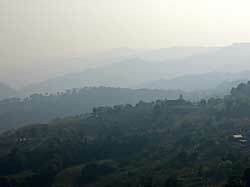 In the background, you see the hills and mountains: it’s truly a lovely area. When we were there in mid-January this year (2014), we were lucky enough to see some trees with pink blossoms in bloom – they gave a lovely backdrop and accent to the rolling hills with the tea plants. 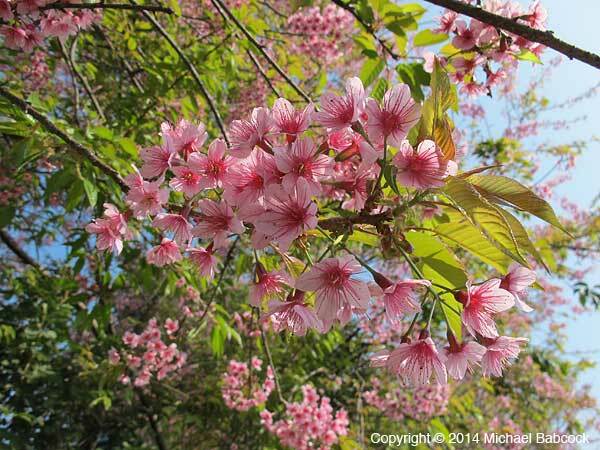 These trees are often called sakura trees, the Japanese cherry tree. 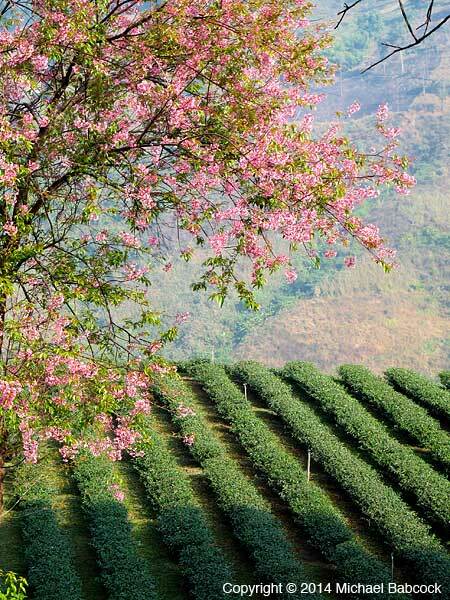 Although reminiscent of sakura trees, they are actually a tree native to Thailand and not a cherry tree at all; this variety is taller than the sakura trees and the blossoms are smaller. It is advertised as such because of the fame of cherry blossom time in Japan and is therefore more familiar to people. 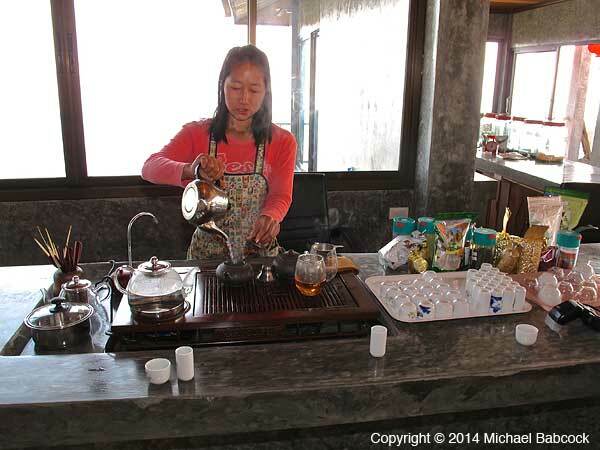 We tasted the pu-erh tea at the Mae Salong Villa, where the Choke Chamroen Tea Company provides tastings. 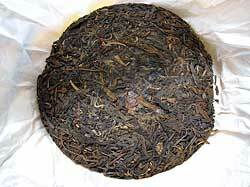 It is a high quality pu-erh green tea, aged 8 years. We went through roughly 12 different infusions of the leaves during the tasting; it was marvelous to note how the flavor changed throughout the process. The tea left a lovely aftertaste that spread throughout the entire mouth. 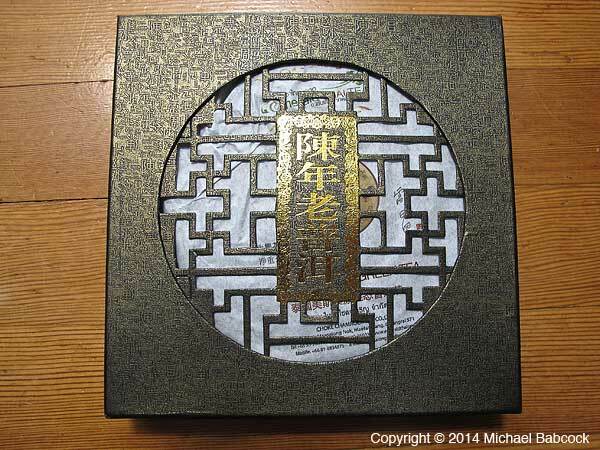 I bought disk in lovely packaging to bring home. The cost was 2,000 baht (about $63, at the time) for 357 grams, about 12-1/2 ounces. It may seem expensive but when you realize how many infusions you get out of each set of leaves, the cost isn’t that outrageous. I will enjoy it here in the states for many weeks to come. 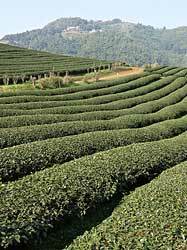 In the area there are numerous places where you can taste the local teas. There will be a set-up such as the one above left where different teas will be prepared for you to taste. We found an oolong tea that we liked very much at 101 Tea Plantation. 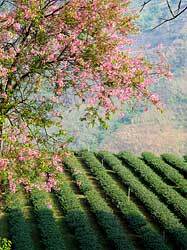 We saw the sign above right on the road, right in front of rows of tea overshadowed by the blossoming “sakura” trees. 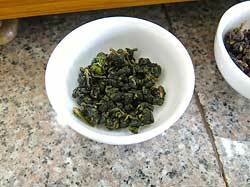 At the tasting counter the tea leaves were displayed in cups so that you could see what they looked like before brewing. At this place they also add blossoms to some of their teas for added flavor, such as the ones above right. I don’t know what the name of this blossom is. 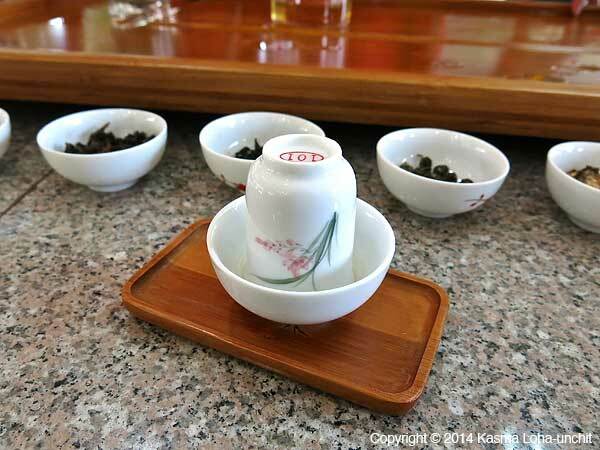 To the left you see the set-up used to taste tea: there’s a whole ritual to it. 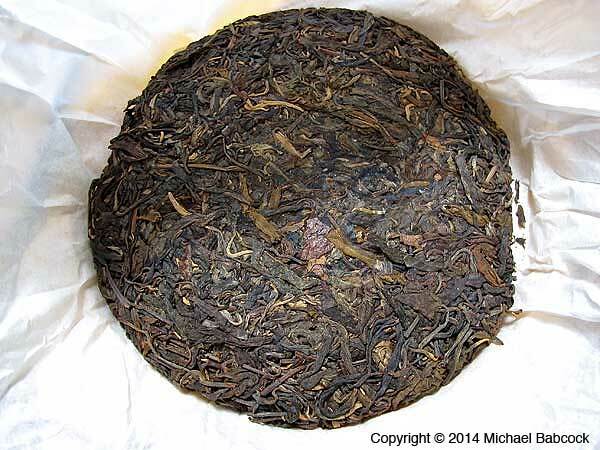 Tea is steeped and poured into the tall cup. Then the smaller cup is placed on top, you flip the cups over and pour the tea into the small cup. 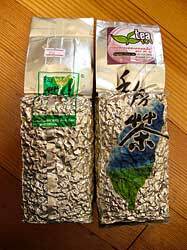 You then smell the aroma of the tea from the tall (now empty) cup and taste from the small cup. 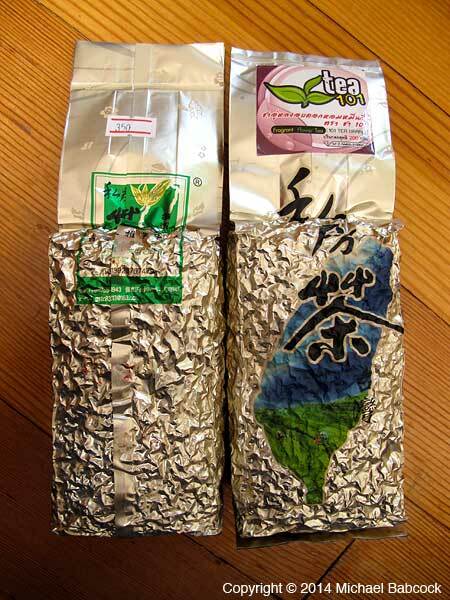 We liked a particular oolong tea with blossoms very much and bought a couple bags (packages on the right) to take home for gifts. 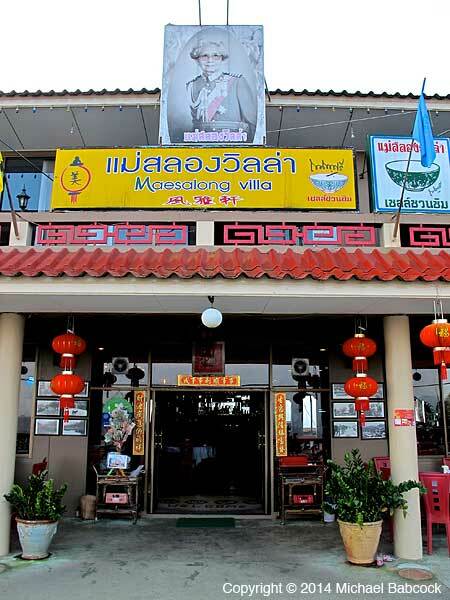 If you go to Mae Salong, be sure to stop and have some Yunnan Chinese food. 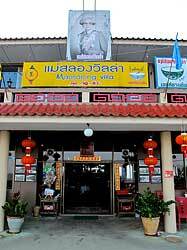 We had dinner at the Mae Salong Villa, which is where we purchased the pu-erh tea. Above left is one of the views from the front of the Villa. 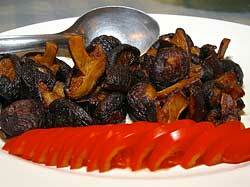 Above right is a fish dish we had, smothered in a lovely sauce, that included mushrooms. It was quite tasty. 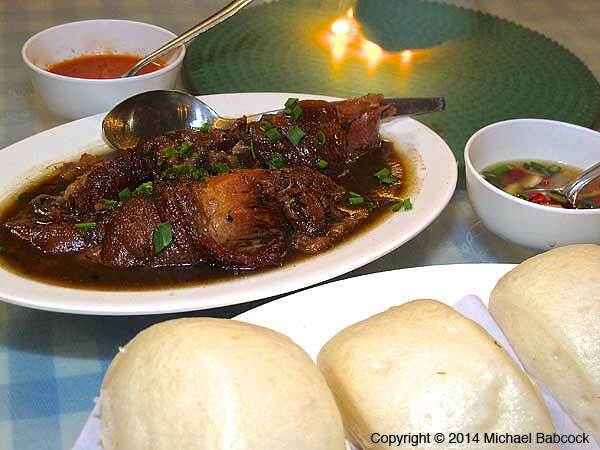 We also ordered Stewed Pork Leg with buns, Yunnan-style, a truly delicious dish. And since the area grows mushrooms, we ordered a stir-fried mushroom dish that was very good. There is an interesting morning market at Santikhiri. 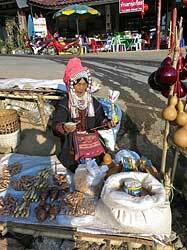 It is definitely a local market and most of the vendors are from ethnic hill tribes, mostly Ahka. This is not a tourist market – it’s meant for locals. It’s best to go early; it starts at 6:00 a.m. or even earlier. By 8:30 a.m. or so many of the vendors have already packed up and left. 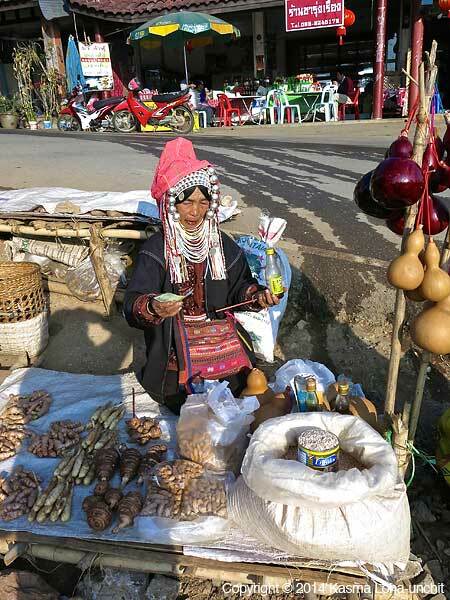 The area does get a lot of tourists and the Akha vendors are savvy to this: they do not want their picture taken unless you buy something from them or pay them for the privilege. You are currently browsing the Thai Food and Travel Blog blog archives for May, 2014.